I have to admit, today’s Bulls-Knicks game was hard to watch. There was some good, Derrick Rose returned to the Bulls lineup after missing 12 consecutive games due to a groin injury, he proved he was ready to make an impact, but he also has some work to do. No matter how many endurance drills you practice off the court, nothing is quite the same as the real deal. There was some bad, Carmelo Anthony had his best game as a Knick, 43 points and seven rebounds. He hit two clutch 3-point shots, one at the end of regulation and the other with 8.2 seconds left in overtime putting the Knicks up 100-99. Rose looked really rusty and timid in the first quarter, he only had seven points. He must have found some confidence in the locker room at halftime because he had 14 points in the third quarter. He looked a bit more like himself in OT, but couldn’t make a tough floater for the winning shot. 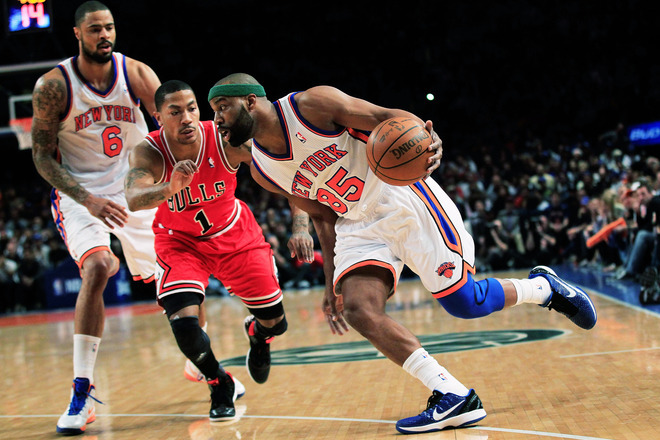 Rose played 39 minutes, had 29 points, six rebounds, four assists, and eight turnovers. The main problem with Rose’s return was the turnovers, we all expected rustiness, but no one wants to give the ball to the opposing team. The Bulls currently have the best record in the NBA, but after today’s loss they fell to 43-14. Coach Tom Thibodeau will continue to push his team to the number one seed, his starting lineup has only started 11 full games together this season and they lost for the third time in four games. Hopefully Tuesday night’s rematch at the United Center will bode better for the Bulls, but I am definitely not looking forward to another 8:30 p.m. start – it’s way past my bedtime. This entry was posted in NBA and tagged Bulls, carmelo anthony, Derrick Rose, knicks, Tom Thibodeau, united center by Marques Says. Bookmark the permalink.